Close your eyes for a second and imagine your city. Think of everything that belongs to the place from the gray streets full of black, red and blue cars to the flashy signs of shops, numerous people hurrying from A to B, passing yellow crosswalks and gray buildings under a light blue sky. Now think which colour you saw the least often! Maybe orange, or purple? 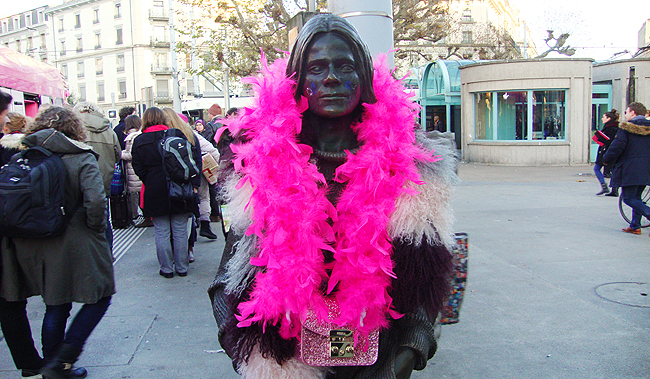 But wait, no: It was pink, right? Possibly there was a little girl with a pink unicorn balloon or maybe you even imagined me entering a beauty store, but I bet there was little or even no pink in your imaginative city. Pink, the colour we connect with feminity, the innocence of childhood and unconditional love is almost not present in the daily life of most people. Isn't that a quite sad thought? 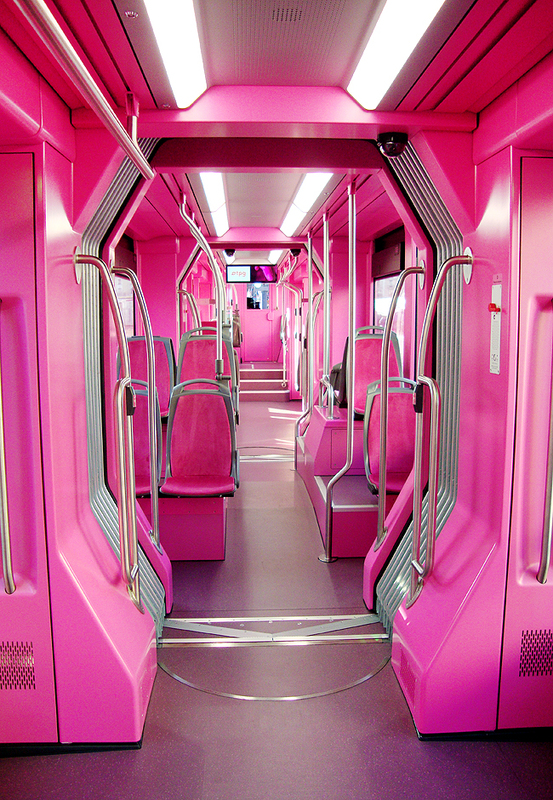 At least when you live in Geneva, this might not be true anymore: Swiss artist Pipilotti Rist designed a train that is pink from the outside and inside. 250 kg of colour were required to realize the Monochrome Rose project. 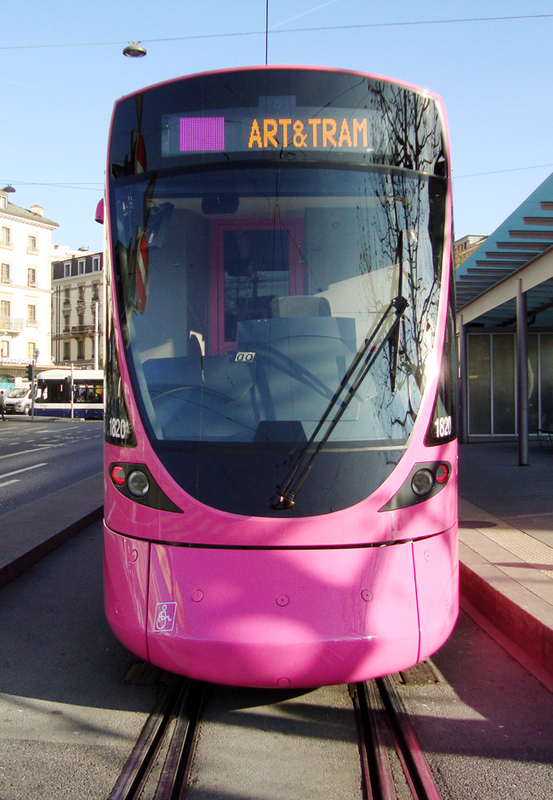 The tram is part of the project art&tram, which aims to make art part of urban life. 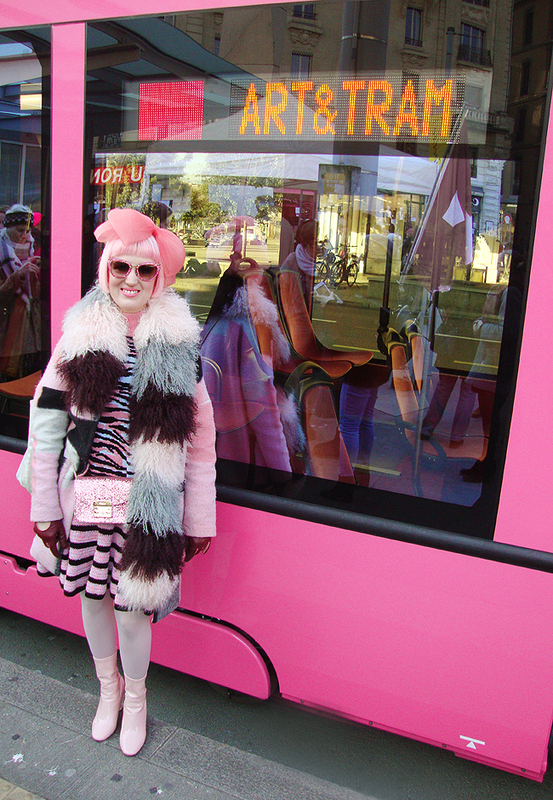 Pipilotti Rist says that the tram has "emerged from taking an exquisite bath in a sea of colour, with the drops of pigment still dripping over the whole of its body." 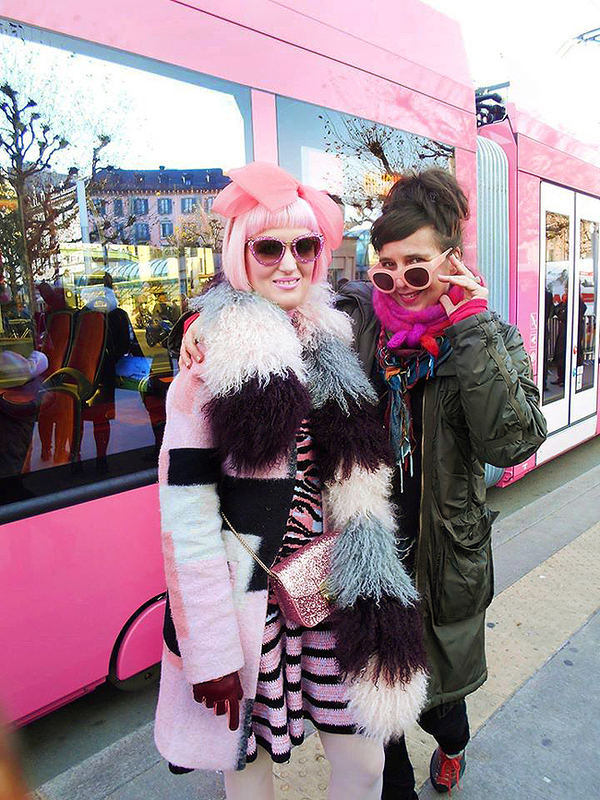 The inauguration of the tram was about two weeks ago, and I was very honoured to be part of it. I have always loved the art of Pipilotti Rist with its winking humour, strong sensuality, uncompromising boldness and exuberant feminity. I remembered how I encountered her work for the first time in my first year at art school. I admired the classical paintings in a museum for their virtuosity and craftmanship, but somehow something was missing that depressed me: Colours and quirkiness. But then I discovered a quite tiny screen in a corner playing video art: "I'm not the girl who misses much" sang a hypnotical, female Mickey Mouse voice through the speakers. I was fascinated and drawn to it like the moth to the light; I thought: No, I indeed don't miss much, not anymore, while I was overwhelmed by a wave of colour coming into my life through Pipilotti's work. This installation was one brick stone in a wall of events convincing me of the necessity of a life in bright, vivid colours. 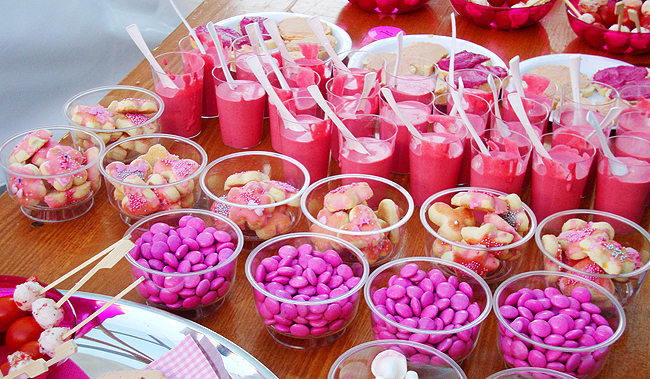 Yes to embracing rainbows, yes to pink! 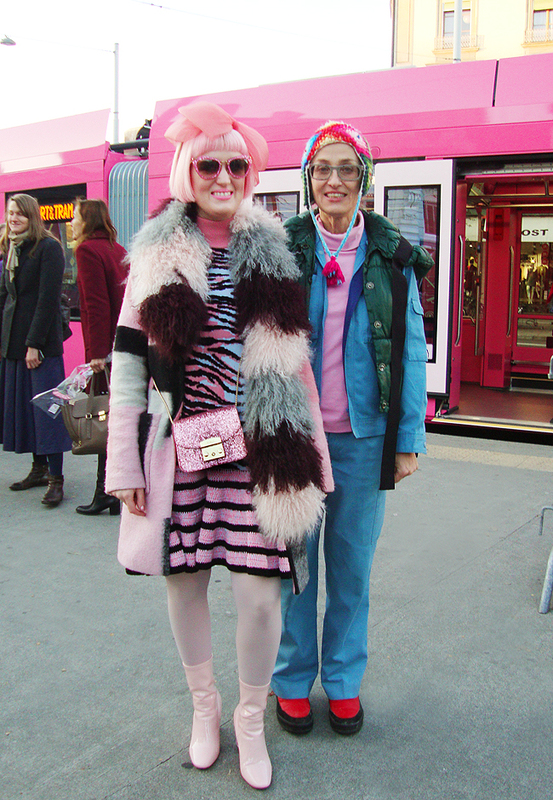 Being in the all pink tram was like a dream for me, and I am convinced Barbarella would trade her spaceship for Pipilotti's tram. It's like a break from your usual life when you enter the pink, playful world, a place which is cheerful, filled with positive emotions and where pink is the new black. You could see it as the fearless grown up version of being inside the whale in the story of Pinocchio. When the doors after a ride open and you have to disembark, you will regret leaving this pink paradise and secretly wish on your next journey the pink beauty might pick you up once again. 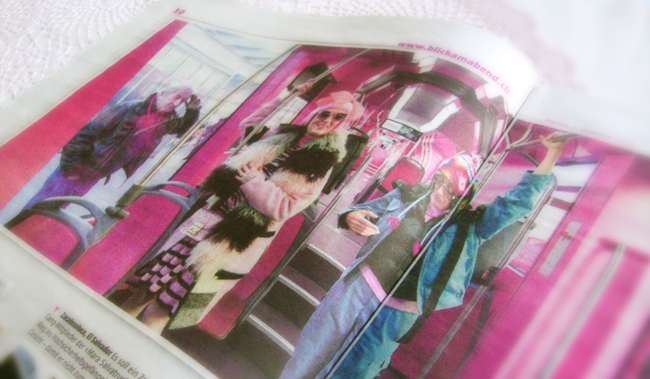 At least I have a lot of souvenirs from this day, because all Swiss newspapers printed the picture of Pipiotti and me in the tram to remember the best pink day of 2016.